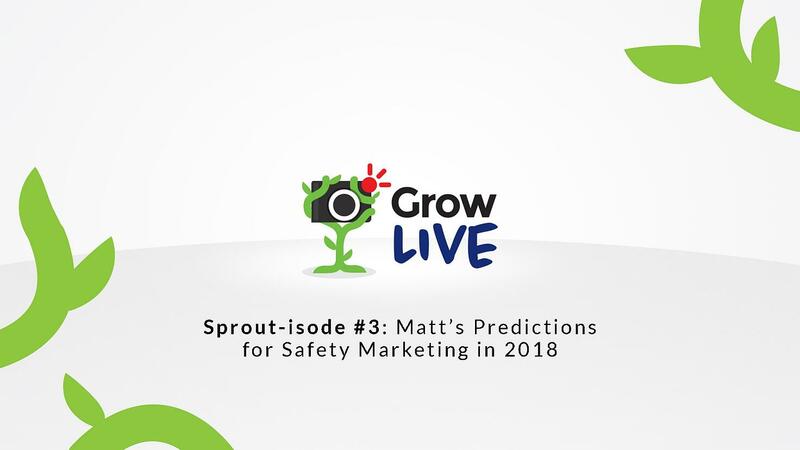 Join Matt on this week’s Grow Live as he offers his 2018 insights and predictions for the industrial space. He says it’s time to be smarter about the way we market to today’s buyer. From better sales enablement processes to improving our websites’ user experience, there’s many ways to ensure growth in the new year. Matt is throwing down another challenge. Before 2017 draws to an end, sit down with your head of sales, head of marketing and your leadership team. Brainstorm how you plan on adapting to the changing buyer’s journey. Don’t forget to come back next week for a special Grow Live episode when our team shares our funnies, our mistakes and our learning experiences with you! And if you need a little help with your marketing plan for 2018 and beyond, just click here to schedule a consultation. So, Renia's out, my normal co-host, and she likes to say that the nerds take over. Well, today, guys, the ninjas are taking over. This is all ninja, all day here on Grow Live, and we are going to talk about some good old-fashioned sales and marketing tactics, so none of that nerdy data and SEO stuff. That stuff's important for sure, but today, if you're a sales rep, or if you are a traditional sales and marketing pro, this is going to be right up your alley. I'll tell you what we're going to talk about: three predictions for industrial marketing in 2018. This is kind of my take on the three biggest trends and big ideas that are affecting your world for the year to come, so I want to get these things on your radar so that you're aware of them, and I want to give you some practical advice on how to tackle these initiatives so that you guys can be successful and adapt and grow in the year to come. You ready to go? Let's do this thing. The first one I have for you today is sales enablement. You're going to hear us talk a lot about this, but this is a super-high priority in 2018 for most industrial suppliers and distributors. The reason why this is is going back to this idea that I talk about a lot, and that the industrial buyer's journey is changing. It's changed, it's in the process of evolving. So what's happening, guys, is many of the traditional buyers that you have worked with over the years are cycling out, and more younger ... I'm going to throw this term around, and I hate it, but millennial purchasing agents are coming into the workforce. And these people, along with the world that we've kind of grown up with, like this easy, accessible world, where we can log into Amazon and buy things with one click, this whole thing is coming together to dramatically change the expectations of your buyers. So this is an important thing to keep on our mind, and what that means for us is, as marketers and sales reps out there in this industrial supply world, is that we need to adapt right alongside of our buyers. So if we're seeing our buyers change in the way that they're going and they're making purchasing decisions, we need to change right along with them. So what we've seen over the last couple years is pretty much sales being flat, or minimal growth, and if there is growth, it's usually just trading market share back and forth. What this tells us is that the sales process needs to change fundamentally. So, what I'm going to predict for 2018 is that more and more distributors and suppliers are going to invest in a modern CRM software solution. Modern CRM software is a lot different than what you think it used to be, okay? It's not this clunky, database-driven, boring software that ties people down, but it's really this freedom-inducing solution that helps you scale, as a sales rep, helps you achieve more than you would have been able to otherwise. Some of the software solutions out there for the sales team are really revolutionary, and they're changing the way that we do sales, so they're creating better visibility, they're producing all kinds of analytics and data, which help us make data-driven decisions. Now, the nerds aren't here, but even this ninja can appreciate making a decision based on data, as opposed to just gut feelings, and so when we have data on our customers, and we have better visibility about what they're doing, how they're interacting on our website, and how they're interacting with the sales team, we're going to be able to close deals with better frequency in a better rate. Also, guys, the CRM software out there today has all kinds of automation features in it, so you don't need to just throw bodies at the problem. If you are an executive out there, and you are thinking that the way I'm going to grow in 2018 is by throwing more sales bodies out into the field, I think you're dead wrong on that. I think the solution is not about adding more people to the workforce; I think the solution is getting smarter about how we go to market, and smarter about the way our sales process is executed. So that's my first prediction, and here's the thing, guys. Legacy sales reps out there ... And if you are a legacy sales rep, I have a ton of respect and a ton of admiration for you, because I grew up around you guys, I know what you're going through, I know that you are the best at what you do, I know you offer a ton of value. And here's what I would say, though. If you are a cold-caller, if you are an order-taker, if you are a door-knocker, guys, it's time to change or get left behind. I'm fearful about the business model that centers around the ability to cold-call, to take orders, and to knock on doors. That is not a scalable model for today's buyer. Today's buyer does not want to be cold-called; today's buyer does not want you to take their order. They can go to a website for that. Today's buyer does not want you to intrude on them. They are already overwhelmed with so much information, and so many things happening in their life, that they don't have time for unplanned or interruptions in their sales, and with their engagements with sales and marketing professionals. So, guys, if that is where you're at, or if that is where your team is at, it's time for a revolution in 2018, a revolution in terms of the way that you guys approach the sales process. It needs to be digital, it needs to be automated, it needs to be smart, it needs to be helpful. It cannot be a matter of taking orders. Amazon can take orders. The big distributor with the million-dollar website can take orders very efficiently. You guys need to become more than order-takers. And also, on the supply side, if you are a supplier, and you are about taking orders, again, the relationships that your new distributor reps are wanting from you is more of a collaborative teamwork approach. So, I highly recommend that we adapt the way that we go about selling, so that it better fits the new buyer that's out there, both at the distributor level and at the end user level. So, enough about that. You'll hear us continually preach about this, but I want you to know that the new buyer is out there, and that they are making ... They're making things difficult for traditional or legacy businesses. Number two, so my second prediction for 2018, and I really don't want to be doom-and-gloom here, guys, because this is a fun time of the year, and I'm certainly the most optimistic person that I know, but I'll start off with a little bit of a heavy warning here, and then I'll move into some solutions about what we can do about it. But number two is, Amazon will begin stealing your B2B industrial supply business. Okay? It's just a matter of fact. It's going to happen; it's just a matter of time, and the question is, will you be able to fight back, or will you be able to adapt to that situation? So I'll tell you what happened to me recently, is that as a business owner myself, I log onto Amazon just like you; I buy some things at Amazon. I especially buy things this time of the year; it's a great way to get some Christmas shopping done. But I went on there recently, and I logged into my account, and wouldn't you know it, they had a marketing ... A strategic marketing initiative centered at me, targeting me as a business owner, to switch over to Amazon Business. This is their new B2B channel. Amazon Business is a really robust, up-and-coming facet of Amazon's entire go-to-market strategy, so they're investing tons and tons of resources into building out the world's most comprehensive B2B network of supply chains providers. So what they're doing is they're bringing all of these suppliers together, all of these manufacturers, all of these brands, all of these retailers, and they're making the buying process easy for that new buyer. So, let's just call her Purchasing Manager Mikayla, okay? This is your millennial purchasing agent. You should get familiar with Purchasing Manager Mikayla. This is somebody who should be on your radar. If you are a distributor, and even if you are a supplier, you should be thinking about this as one of your end-user personas. Okay, so Purchasing Manager Mikayla does not understand why your website looks like it was built in 1998. Purchasing Manager Mikayla does not understand why it is slow, why it takes so long to do business with you. Purchasing Manager Mikayla wants to get in and get out. Purchasing Manager Mikayla doesn't understand why, when you keep calling her, she looks you up and she can't find any of you guys on social media, so she thinks you're sketchy. So, here's the deal, guys. This persona is somebody who is changing the game in our industry. If you are a distributor, this is a serious concern, right? The threat is real, and I think we have to acknowledge that the threat is real, first of all. We cannot be in denial about this. The world is changing; the way that people are buying products — and buying products for business — is changing, okay? I actually have a contact with a group of purchasing managers here who do nothing but eCommerce purchasing, so they will not take orders from people that come in with order pads. They only schedule meetings on their time, they only go to websites where they can log in, create an account, and purchase something and get out of there. They're all about optimizing their time, because they have a lot of things to do, so they don't have time to go through this traditional sales process. So as a distributor, here's my thought, guys, is you basically have three choices. Number one, you can join Amazon, and just deal with the low margins and the customer service headaches that you can be sure that will follow. When you sell something through Amazon to an end user, and that customer wants a return, then it has to go through Amazon and through you, and so there's multiple layers involved, and it can be a real headache. On top of that, you don't know who your customer is, so you can't actually convert them over to your website. They probably wouldn't want to anyway, because Amazon has that great experience. But some distributors are choosing to join Amazon, and they are seeing a lot of gains in this area. Keep in mind, this is low-margin gains, so this is a question every executive out there needs to be asking. "Is it worth it? Do we want that money?" Some people are saying no; others of you may decide, "Yes, this is a channel we need to be a part of." So I would say that is one option. Number two, you can fight back aggressively with a better eCommerce user experience. Not better than Amazon, that's impossible, don't even worry about that, but better than your competitors, and better in that it's a more personable approach. It may not be the billion-dollar platform Amazon has, but it may be more personable. It may have more content that can help educate your buyer. It may have better resources that will help your buyer make a decision about a product. So, fighting back with a better eCommerce user experience. Also, on the sales side, making sure that the sales process is modern, digital, and focused on collaboration, focused on solving problems rather than selling. So your newer millennial buyers, your Purchasing Manager Mikayla is not interested in a traditional sales process. She wants this thing to be helpful, she wants you to provide relevant information, and then get out of her way so that she can make a decision about the products that she needs for her business. So that would be number two, is fighting back. Number three, you can do a combination of the two, and this is actually where I land. I think that there are some ... It does make sense strategically for some businesses to partner with Amazon in the Amazon Business world, and while also trying to convert those buyers over to your brand. Because here's the other thing about Purchasing Manager Mikayla, our millennial buyer persona: This person, believe it or not, is not all about the big brands. She is a little bit of a rebel, because she's been marketed to her whole life, she doesn't want to necessarily support the man, and believe me, Amazon is the man, no matter how good the experience is. Walmart is the man, you know, these big, big brands that are massive corporate empires. They don't necessarily want to support these brands; it's just that they make it so easy that they really have no other option. So here's how you can win if you are an independent industrial distributor. You can win by providing a level of service and a level of value that those companies, those massive corporate empires could never offer, and you can do that by way of creating content that educates them, videos that explain products, buyer's guides that help narrow the selection down. One of the things that Amazon has is that great search functionality, but you're still having to search between thousands and thousands and millions of products, so what you can do, and one of the great ways you can offer value is by making it very simple, having specific vertical catalogs developed for your buyers, so that they can see exactly what they need, while not having to worry about everything they don't need. You can win against Amazon, you can fight back, but you have to invest in some modern technology, and you have to invest in communicating the value proposition that you know you already have an advantage with. So, by doing that, I believe you can do both. You can actually convert some of that business, and you can win in this scary world. So it's not all doom and gloom; there is some hope there for those of you who are progressive enough to see the advantage of investing in that technology. Okay, so, let me take a breath here, and we're going to go to number three. So, number three is really speaking to your marketing managers here, and this is the idea that brands in the industrial supply world will continue to diversify their marketing spend by executing a more holistic approach, so that they can reach a more diverse customer base. What I mean by that is, instead of doing maybe five marketing key initiatives for the year, a marketer in 2018 may need to do eight or nine or ten marketing initiatives. And I'm not saying doubling or tripling your marketing budget, although that may be important for some of you. What I am saying is that you scale back in some of the areas that you know are not creating the return that you would like, and you invest in some areas that you know are going to reach a broader base of your customers. Here's some examples of what that might look like. You could scale back the size of your trade show booth. I know a lot of brands are spending hundreds of thousands of dollars every year on trade show real estate. You could scale back the size of your real estate. I'm not saying don't show up at the shows; I'm saying show up, but show up more conservatively, so that ... And when you come to these shows, have better automation and better follow-up, okay? So if I could take $20,000 out of your trade show budget and invest it in some marketing email automation, some email drip campaigns, pre-show, post-show, and a better sales follow-up process, that would be money well spent, and I think you guys would agree with that. Another thing that you could do is, instead of producing the large, full-scale catalog, which really should ... That should be your website, realistically. The website should serve in that function. But instead of creating this master catalog, how about creating small, more frequent catalogs? These can be vertical catalogs focused on specific industries that you could launch at different points of the year. 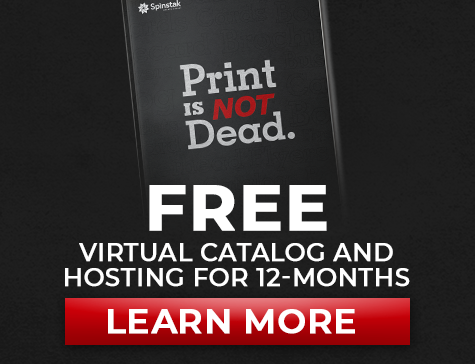 They could be seasonal, in that the ... For instance, if you're in construction, or if you work with people that are outside users of your equipment, that may be a seasonal catalog, a spring, summer, fall, or winter. But smaller, more frequent catalogs, these are small ... People do not want a book delivered to them; people want a magazine, and they want a good magazine with high-quality images, not a lot of fluff, just show me the products. Help me understand what would be applicable to me and to my business. That's a good example of print advertising and print marketing. Here's what I would say too. You can scale back, and you should scale back, the traditional print advertising that you're doing. So if you're investing in full-page ads in industry mags, remind yourself that you're only hitting a small portion of your buyer now, because now, your buyer isn't just that 40 to 60-year-old safety manager. Now, your buyer is the 20 and 30-year-old safety manager who just graduated, or who's just entering into their career, so you need to consider the people that are in the beginning of their career, as well as the ones who are on the latter end of their career. And you can do that by splitting your advertising into two buckets. One is your traditional bucket, and one is your social bucket, or your Internet, or your digital bucket. We want to make sure that your brand is seen on Facebook and Twitter and LinkedIn, and all of these places where people are spending the majority of their time, to be honest, and getting your message in front of them. One of the things you'll notice in the coming years is that your mobile device, your phone, is the equivalent to what the TV was back in the '60s. So, where people were glued to their TV back decades ago, that's what people are doing today with their mobile devices, and it's important to remember that now more than ever, the time is right to purchase ad space in those channels. Facebook ads, the costs per click are so low, it's ridiculous. I can get seen by 15,000 end users for just a few hundred dollars. So that's a significant difference from your traditional ad spend, so I'm recommending, and I'm predicting that more and more industrial suppliers are going to be using these channels to get their brands in front of their end users. And you may say, "Well, how do I do that?" Well, guys, it's amazing, these channels are becoming more sophisticated every day. They're collecting more and more intel, more information on demographics, and so we can build an audience now for industrial end users regardless of the market, regardless of the persona, regardless of the company, even. You can even break it down to a company level, and target account-based ... And do some account-based marketing techniques to get to a company level. So, amazingly cool things you can do on social right now with all of those new tools that they're ... What they're releasing. So, guys, this is a lot to take in. These are three ideas, but I think they're massive, right? So, just to kind of recap, number one was this idea of sales enablement. So, again, sales enablement meaning, how are you going to put together a sales process and a technology stack for your sales team that is going to help them compete, and help them win that new buyer business? So those buyers out there that are expecting a better experience, that are expecting a digital sales process, not an old-fashioned one, how are you going to adapt to that way? And I think a lot of companies are seeing it's time to make a shift in the way that they do sales. So that's number one, is sales enablement. Number two; I'm warning you about Amazon stealing your B2B business. There's some things you can do to help prevent that or minimize it, and it all centers around user experience, making sure that your website is highly functional, making sure that the sales process and the marketing collateral work together to create a better experience than Amazon. It can be done, guys. We know it can be done, because I've seen it with some of our clients, and they're doing a good job in that regard. Number three is that brands will continue to diversify marketing spend, and creating a more holistic approach so they can reach a more diverse customer base. We have, for the first time, I think, in the history of our industry, we have people that are in their 70s working. It's unheard of. There are people in their 70s who are still in the business right now, working. How are you going to reach those people? There's people that are in their 50s and 60s. Those are people that are traditional, they've been doing this for a long time, they're really experienced, but they may not be tech-savvy. And then there's this whole group of 20, 30, and 40-year-olds who have grown up with technology and who are very familiar with it. And so the way you will reach all of these different buyers needs to be different and thoughtful, and so being more diversified in your marketing approach is going to be important for this next year, and really, in the next five, ten years. Okay, so that's a lot to take in. I'm going to move to a section now that we call the call to action, and this is a chance for you to apply some of these things that we talked about in your marketing plan for 2018. I know you have a full plate, I know you have to attend shows, I know you have projects to create, customers to serve, places to go, but here's my challenge, here's my call to action. Sit down with your sales director, your marketing director, your leadership team, your CEO, whoever is in charge of direction for the go-to-market strategy for your business. Sit down with these people, and devote two to three hours ... And I would do this in the next month or two. Devote two to three hours ... No, skip that. Do it next week. When you get back from Christmas, get this meeting on the books. When you get together, I want you to have a brainstorming session about how you are going to adapt to the new buyer's journey. What two or three things are you going to do that are going to be different, that are going to bump the status quo, and help you fight back against the big brands, and against the big companies that are seeking to take your business? How are you going to keep the customers you have, and how will you win over a new generation of buyers with deep pockets and decision-making authority? Those are deep questions. I think it deserves two or three hours of your time and your leadership's time. So that's my call to action for today; I hope that it's helpful. So, guys, next week, we are going to be having a special holiday vidcast of Grow Live, and I'm excited about this. We've been talking to each other about this idea. We're going to have a bunch of members of the team get up here, and we're going to reminisce about what we learned in 2017, including some of the embarrassing mistakes that we've made, but, spoiler alert, those are the mistakes that made us better, and we're excited to share them with you next week. So come back for Grow Live next week. We'll have a chat about how to grow from mistakes. And then, I do just want to ask you guys one more thing. Go to our website, Grow Live ... Or, GrowWithSMS.com, and if you are ready to talk about some of these things that we have discussed in the episode today, and you want somebody to just walk through it with you on a one-to-one basis, I am taking consultations for 2018 right now, so you can go to our website, GrowWithSMS.com. You'll see on the home page, very obvious call to action, "Schedule a Consultation," and I look forward to talking with you. Until then, guys, I hope you all have a very merry Christmas, and enjoy your time off, and we'll see you again very soon. Take care.